Superstar Amitabh Bachchan inaugurated the 23rd Kolkata International Film Festival (KIFF) along with West Bengal's Chief Minister Mamata Banerjee. Sharing the stage with Big B and Mamata Banerjee were other stars like Kamal Haasan, who recently celebrated his 63rd birthday, Kajol and Shah Rukh Khan. This year, the eight-day-festival festival will have 143 films by 135 directors from 53 countries, being screened across 12 venues in Kolkata. KIFF will also pay homage to cinematographer Ramananda Sengupta and actors Om Puri and Tom Alter. 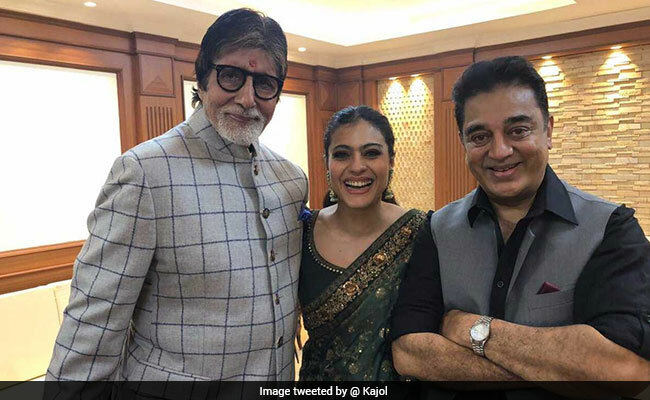 Kajol, 43, couldn't 'resist' and posted an amazing picture with two 'legends' - Amitabh Bachchan and Kamal Haasan from KIFF. The trio were all smiles and posed for a happy picture. Shah Rukh Khan also tweeted about KIFF and wrote: "Too much fun and love at KIFF 2017. Love my Kolkata & as always the warmth of @MamataOfficial...U r the sweetest." The 52-year-old actor, who is Bengal's brand ambassador, also requested a dhoti at the festival. Shah Rukh said, "Next time I am going to ask my friends to give me a dhoti also... Come and speak in full Bengali... fluent also and be here," reports news agency IANS. Amitabh Bachchan, who recently wrapped up his quiz show Kaun Banega Crorepati, also spoke at KIFF. Tracing the influences of regional music in Indian cinema, the 75-year-old actor spoke about the "indelible" effect of music from West Bengal as also the importance of South Indian Carnatic music, the Lavni of Maharashtra, the Lohri and Bhangra from Punjab, the folk songs of Uttar Pradesh and Rajasthan, the nautanki music of Bihar and the vibrant Garbha of Gujarat in Indian cinema. On the work front, Kajol was last seen in Tamil film Velaiyilla Pattathari 2 (VIP 2) while Shah Rukh Khan is currently filming Aanand L Rai's yet-untitled project with Katrina Kaif and Anushka Sharma. Amitabh Bachchan will be seen in Thugs Of Hindostan, co-starring Aamir Khan.